There were some blueberries left from making blueberry pancakes this past weekend, so I decided to make some blueberry muffins. I was about to start, then I saw half of an apple sitting on the counter (leftover from making caramel apple pork chop), and I thought why not toss in apples to make the muffin more moist. My recipe is based on this recipe from Rasa Malaysia, but I add in apples and also change the mixing method by folding whipped egg white into egg yolk mixture. Sift the flour, baking powder, and salt into a bowl. Stir in 3 tbsp of sugar. In another bowl, hand whisk egg yolk, milk and melted butter until blended well. Pour the yolk mixture over the flour mixture and whisk until just combined (do not overmix– the batter will be slightly lumpy). Use a electric hand mixer, beat egg white until fluffy. Add in 1 tbsp sugar gradually and continue beating until soft peak appears as for meringue. Gently fold in whipped egg white into the batter until just blended (my batter was a bit thick so I added in about 2-4 tbsp of milk– see note below). Add the blueberries and diced apples to bowl, stir them in just enough to combine. 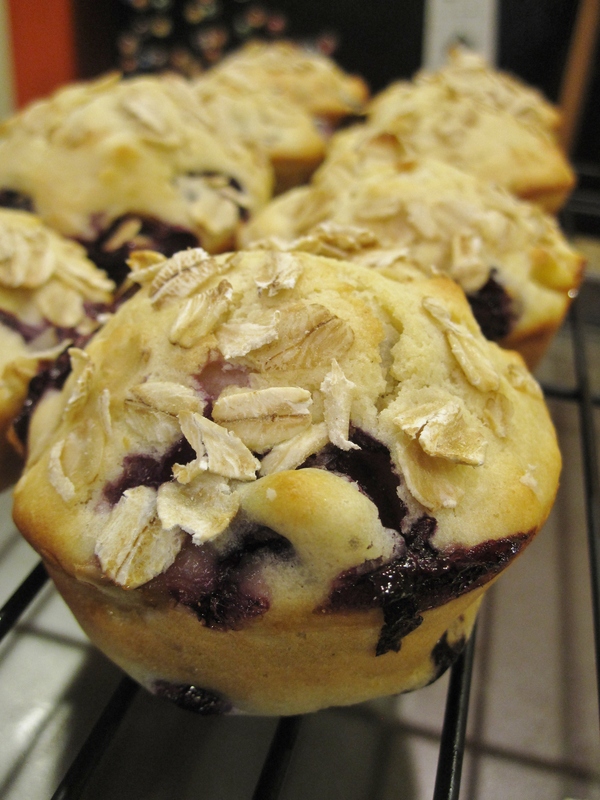 Divide the batter evenly among the prepared muffins cups. Bake the muffins until golden, for about 20 minutes. Remove the muffins from the pan and cool on the rack. Egg– I used only 1 egg yolk, so my batter (before adding whipped egg white) was quite thick. The whipped egg white doesn’t have enough volume to lighten up the batter. Next time I should try using 2 eggs yolks and 2 egg whites.